We are currently conducting a programme of research around generational diversity and its impact on HR and management practices. With five generations now in the workforce – Veterans (over 65s at one end) to Generation Z (under 22 at the other end) – employers and managers are faced with people who have very different social, career and economic deals as well as different skill sets that are all valuable to their organisation. We are looking at the impact of this diversity of expectations on how employers can attract, engaged, develop and retain the people they need. Why is it an issue for employers? The socioeconomic differences between workers across the generations is more pronounced than any time since the second world war. Yes, even more than those in the swinging 60s and their parents’ generation. And these differences matter for employers. What is making generational differences more important to employers than in previous times? The flatter structure of workplaces mean that there are fewer opportunities for younger people to progress ‘up through the ranks’ whilst older workers have experienced real change in how they are expected to manage their careers. The onus over the last 20 years has moved from employer to employees in most industries. The technology revolution has affects us all and organisations are battling for people with digital and social media skills. Suddenly the traditional hierarchical organisation where the boss knows best, is not longer the case. Many managers are finding that they are managing people with skills they don’t understand. Some of the people with the key skills needed by the business are in their 20s. Look back at the workplace of just 30 years ago and things were very different. Younger workers were seen as energetic but lacked the expertise of their more senior colleagues. So why does all this actually matter? Well, it creates a paradox for employers. On the one hand, HR is expected to offer a ‘fair deal’ to all yet this means very different things to different people. Of course, there have always been differences in what people want and expect but we can better predict some of these differences based on people’s age groups. This generational ‘lens’ can really help employers who find it difficult to attract or retain people from certain generational groups. It can also help if employers find problems with engagement amongst certain groups in their workforce. Current project - Who are Generation Z? We are currently looking at the new generation entrants to the workforce. Faced with the key decision about whether to pursue a university education OR be able to afford to buy a house by the time they're 45 years old, this new generation of workers look rather different to their pre-decessors - Generation Y. So what kind of relationship are they looking for - what do they expect to give employers and what are they expect to offer in return? 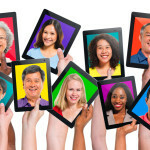 The research examined why generational diversity matters as an issue for HR practitioners. We investigated the implications of generational diversity for employee engagement strategies and what organisations can do to attract and engage the four different generations currently in the workplace. What was unique about this research was the exploration of potential sources of misunderstanding and conflict that could emerge through lack of generational awareness. Tips for creating a winning engagement strategy were identified. 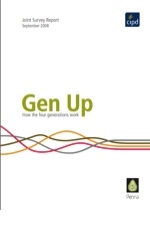 Published by CIPD and Penna October 2008. Authors: Kelly Drewery, Anne Riley and Heather Staff. In the economic downturn, attitudes have changed towards employers. This research report shows how these attitude changes differ between the generations in the workforce which partly reflect their experience of previous economic downturns. The key implications for HR and management practice relate to attracting and engaging employees, supporting those employees to perform, and managing employees through change. This research is a follow up study from the 2008 Gen Up research. Here, Kelly explores the impact that the recession has had on those currently in the workplace. The deal and level of job security offered to different generations varies greatly and has implications for how employers and HR practitioners seek to engage cross generational groups within their workforce. The implications for recruitment, employee engagement, development and retention are explored. Published Dec 2011. Author: Kelly Drewery. Find out what generation you are in by getting involved in our current research about what different generations look for from the workplace. You can contribute to this research by completing our five minute survey.